VIEW THE ATTACHED FILE YOUR CERTIFIED BANK DRAFT FOR CONFIRMATION. ORIGINAL HARD COPY OR YOU CAN COME DOWN FOR THE COLLECTION HERE OKAY. TAKE NOTE AND DO REPLY IMMEDIATELY. appointed this Bank to effect all foreign overdue payment. Account will be opened for you in our Bank. VIEW THE ATTACHED FILE YOUR BANK DRAFT SCAN COPY FOR YOUR CONFIRMATION. 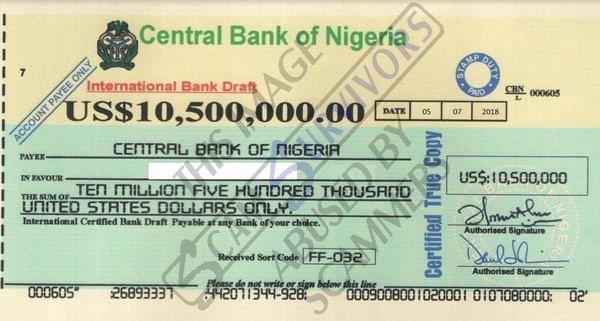 HERE IS THE SCAN COPY OF YOUR CERTIFIED BANK DRAFT FOR YOUR CONFIRMATION AND ALL YOU NEED TO DO NOW IS TO COME DOWN HERE FOR THE COLLECTION OF THE ORIGINAL HARD COPY WITH OTHER VITAL LEGAL BACK UP DOCUMENTS FOR FINAL DEPOSIT AT YOUR BANK OKAY OR SHOULD WE SEND IT TO YOU VIA COURIER ???????? AT YOUR OWN DISPATCH COST ???????? Subject: Re: VIEW THE ATTACHED FILE YOUR BANK DRAFT SCAN COPY FOR YOUR CONFIRMATION. COLLECTION CENTER IS CENTRAL BANK OF NIGERIA. (CBN) LAGOS,NIGERIA HEAD-OFFICE BUT IF YOU CAN'T COME DOWN HERE FOR THE COLLECTION,YOU CAN SEND YOUR RECEIVING ADDRESS WHERE YOU WANT THE COURIER TO DELIVER IT TO AND WE WILL FIND OUT THE DISPATCH COST OKAY. YOUR INFORMATION IS WELL NOTED AND CONSIDERING THE AMOUNT ON YOUR APPROVED BANK DRAFT FOR SECURITY REASON,WE DON'T SEND SUCH VITAL DOCUMENT THROUGH MAIL ONLY COURIER BECAUSE THE DRAFT HARD COPY IS AS GOOD AS CASH OKAY. SENDING YOU THIS CERTIFIED BANK DRAFT ORIGINAL HARD COPY WITH ALL RELATED VITAL LEGAL BACK UP DOCUMENTS TO YOUR RECEIVING ADDRESS AS STATED ON YOUR EMAIL WILL COST YOU THE COURIER DISPATCH COST OF $200USD ONLY AND ONCE YOU SEND IT,THE DISPATCH WILL BE MADE IMMEDIATELY AND THE TRACKING NUMBER WILL BE SENT TO YOU FOR YOU TO TRACK IT ONLINE AND RECEIVE IT ACCORDINGLY. PAY THE COURIER DISPATCH COST ONLY THROUGH WESTERN UNION OR RIA MONEY TRANSFER WITH THE BELOW INFORMATION AND SEND THE MTCN NUMBER FOR ONWARD DISPATCH OF YOUR DRAFT ORIGINAL PACKAGE OKAY. RECEIVER'S NAME : SAMUEL ANTHONY. SEND IT AS DIRECTED AND SEND THE INFORMATION IMMEDIATELY FOR IMMEDIATE FOLLOW UP. WITH REGARDS TO YOUR REQUEST,HERE IS THE BANK ACCOUNT DETAILS TO ENABLE YOU TRANSFER THE MONEY TODAY AS STATED AND RECEIVE YOUR DRAFT ORIGINAL PARCEL WITHIN 72HRS OKAY. BANK BENEFICIARY NAME : KENNETH O. BANK NAME : UBA BANK. BANK ADDRESS : 102 OKOTA ROAD AGOR,LAGOS,NIGERIA. SEND IT AS DIRECTED AND SEND ME THE COPY FOR CONFIRMATION/FOLLOW UP FOR ONWARD DISPATCH OF YOUR ORIGINAL DRAFT PACKAGE OKAY.